I absolutely love the taste of walnuts with sage. They’re both so earthy and robust, and the combination of flavors is simply fabulous. I know it’s more of a Fall taste, but I couldn’t pass up the opportunity to include a walnut-sage bread this week. And not only are the walnuts and sage good enough on their own, they’re downright delicious mixed generously into a whole wheat dough. 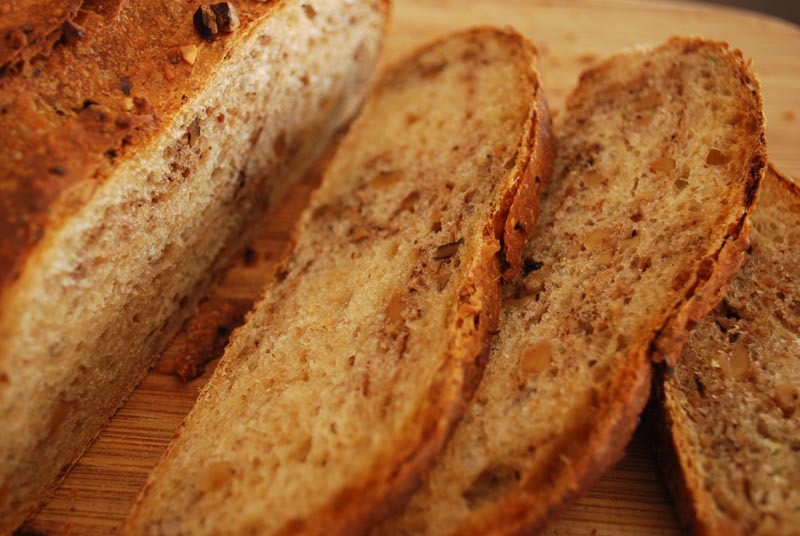 The nuttiness of the whole wheat of course matches excellently with the walnuts; and if you chop them finely enough, it’s hard to tell where bread ends and walnut begins. Speaking of such things, let’s talk chopping of nuts for a minute. Normally, I prefer to chop nuts by hand; but in this case, a food processor will do the job just as well, if not better. Nuts chopped in a food processor tend to end up a little less evenly sized, with some left in big chunks and the rest pulverized to powder. This is actually preferable here, since the walnut powder will sort of dissolve into the dough, while the big chunks provide a lovely contrast of texture. Having said that, though, I did chop these by hand, because I couldn’t bring myself to wash my little food processor, and the cutting board was sitting right there. I tried to mimic the “half chunky, half powdery” result, by really going at half of the walnuts. Result: my hand is still a bit sore, and I wish I had just washed the silly thing instead. But I guess it worked pretty well. One change I might make to this bread next time is to add a little honey or brown sugar to the dough. See, walnut skins are a little bitter, and are nearly impossible to remove. When in such large quantities as the walnuts are here, you will taste that bitterness, though it’s not an unpleasant taste. A little sweetness would balance it out, however; but I didn’t think of it until too late. Caveat baker. This bread comes out with a lovely, flaky crust, and a lovely, rustic crumb. It was good to eat on its own, but I think it would be better matched with something; like in a turkey and blue cheese sandwich, or even to make a bread pudding out of (lemon-walnut-sage bread pudding, anyone?). Or you can do what I did: simply have a slice toasted with your morning coffee. Simple and tasty, somehow honest, it’s what these flavors are all about. 1. In the bowl of a stand mixer, whisk together all the whole wheat flour and 6 ounces of the bread flour, yeast, and salt. Add the olive oil to the water and milk. Add to the flour mixture in the mixer bowl. Using the dough hook, mix at low speed until the dough comes together, scraping the bowl if necessary. Increase the speed to medium-low and knead until smooth and elastic, about 7 to 8 minutes, adding the reserved bread flour as needed to achieve the proper consistency. The dough should be a little slack, but not too wet. 2. Turn the dough out onto a lightly floured surface. Knead a few times, until a skin forms around the outside of the dough. Pull the skin taught around the dough, forming a round ball. Transfer the dough to a lightly oiled bowl, turning to coat all sides with the oil. Cover tightly with plastic wrap, and let rise in a warm place until doubled in size, about 1 hour. 3. Punch the dough down and turn out onto a lightly floured surface. Roll the dough out flat, about 12 to 15 inches across, or as big as the dough will allow. Sprinkle the dough evenly with the walnuts and sage. 4. Fold the edges of the dough over the nuts, so that they meet in the middle. Press to seal. Knead until the nuts are evenly incorporated throughout the dough, sprinkling with additional flour as needed to keep from sticking (see note 2 below). Form the dough into an oval-shaped loaf, and transfer to a greased or parchment-lined baking sheet. Dust with additional flour, cover loosely with plastic wrap, and let rest in a warm place until nearly doubled in size, about 45 minutes. 5. Preheat the oven to 425º F. Uncover the dough, and quickly slash 3 times with a sharp serrated knife. If the dough deflates, let it rest another 15 to 20 minutes before baking. Spray or sprinkle the dough with water, then bake at 425º F for 30 minutes, or until golden brown and baked through. Transfer to a rack to cool thoroughly. 1. If using active-dry yeast, mix the water and milk together, at a temperature of 105º to 115º F. Sprinkle one packet (2 1/4 teaspoons) of active-dry yeast over, stirring to dissolve. Let stand until foamy, about 5 minutes. Proceed as directed. 2. Kneading the walnuts into the dough (step 4) can get a little messy, as the nuts break through the dough and scatter across the counter. It does provide a more even distribution of nuts throughout the dough, but if you prefer a quicker and neater method, try rolling the nuts into the dough instead. Starting at one edge, roll the dough up jelly-roll fashion, pressing the seam to seal. Transfer to the prepared baking sheet, tucking the ends under. Proceed as directed.